CHICAGO – Did everyone see “Men in Black”? Or the film’s two sequels? They you saw “R.I.P.D.,” which unfortunately for the production team has “rip” in the title, because the film is a lazy rewrite and rip-off of “MiB.” Jeff Bridges and Ryan Reynolds are the protectors assigned in this one. The pitch had to go something like this. Picture “Men in Black” except instead of aliens the heroes are chasing lost dead souls. And by-the-way, the heroes are also dead, instead of being men in black. No, the pitchmen weren’t thrown out of the studio office, they green-lighted this 130 million dollar exercise in unoriginality, based on a source comic book. There are ultra special effects here, as it’s poured on like so much syrup on pancakes. Enough of the product makes the dish better, too much makes it cloying. “R.I.P.D” has its moments – truly – when it tries to be itself, as in any scene that the fabulous Mary-Louise Parker inhabits, but then it’s back to creatures straight out of the “Men in Black” factory, so much so that we wonder if the same team is responsible for the monster design in both films. 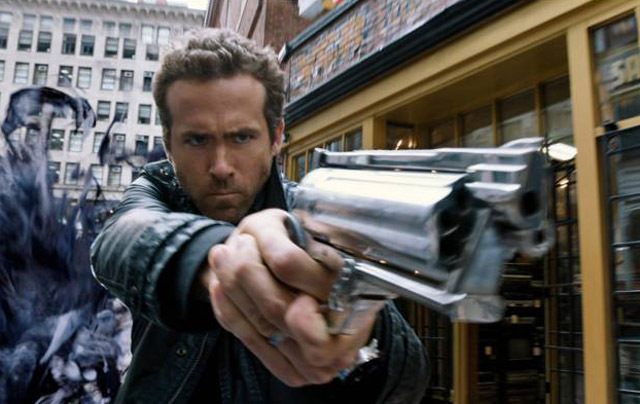 Ryan Reynolds is Nick, a Boston cop famous for his flamboyant drug busts (hasn’t the war on drugs gained a futility in popular culture yet?). He has also teamed up with his partner Hayes (Kevin Bacon) to skim some gold pieces from a recent bust. His guilt about this catches up with him, given his devotion to his wife Julia (Stephanie Szostak), and he tries to get out of the corruption. This leads to his death, as his loose lips sink the ship. Instead of going to heaven or Judgement City, Nick is arisen to the Rest In Peace Department (R.I.P.D. ), an afterlife policing agency that is responsible for picking up lost souls that don’t make to their final reward or punishment. He is given a cop partner named Roy (Jeff Bridges), an irascible cuss who was a lawman in the 1800s (he sports Buffalo Bill-type facial hair). Naturally, as new police partners in movies, they hate each other before they love each other. Can Nick right the wrongs that had led to his demise? The first problem lies in what can be called the “awkward explanations.” This concept of the afterlife is kind of complex, and the weaponry, methods, handcuffs, avatars and finding the lost souls all have to be explained to the audience in background dialogue. At first, this is handled by the Proctor (Mary-Louise Parker at her yummiest), and all seems well. But then, the marbled mouthed Roy takes over, and the voice that Bridges came up for him gets tiresome in five minutes. Yeah, the guns are cool, but how do they work again? And good lord, there doesn’t seem to be any reason for the lost souls to be fashioned like the alien rejects from “Men in Black,” unless the idea is to have film critics and audiences constantly bring up that superior and more original film. All the effort to make the lost souls the same gross super beings as “MiB” seems a wasted effort, given the context of the what the R.I.P.D. has to do to capture them. And the plot itself is muddled. Nick wants revenge, which is why he wants the Boston R.I.P.D. assignment, which would have been quite enough. But the background subplot is about the assembly of golden pieces to create – what? – a doomsday machine? A lost soul reorganizer? They keep explaining and explaining, but it never seems to become clear. Maybe the focus is too much on hey-didn’t-I-see-this-movie-but-it-was-called-Men-in-Black? That’s probably it. But believe it or don’t, there is a bit of entertainment in this film, again when it seeks to be itself. Bridges gets off a few good lines, especially in a useless conversation regarding his full name. Mary-Louise Parker is electric as the Proctor and seems at times to be in a better movie. Pair her with Bridges with the same personas and make that film next time. The “avatars” that Nick and Roy have on earth (James Hong, Marisa Miller) are good for a few moments. And director Robert Schwentke (“Red,” “The Time Traveler’s Wife”) has a unique eye. His visuals of the afterlife are interesting, and his camera work matches it. He should have tossed the rip-off script – based on a comic book – and made up his own consequence.